In the previous articles, we explored what Self-Organizing Maps are and how you can implement them using Python and TensorFlow. One of the most interesting things about these networks is that they utilize unsupervised learning, a different type of learning than we got a chance to see during our trip through the world of artificial neural networks. In this type of learning, neural networks don’t get the expected result during the training process. Instead, they figure out the relationship between input data on their own. Self-Organizing Maps use this approach for clustering and classification purposes and they are quite good at it. Apart from that, we had to redefine the concepts of neurons, connection and weights. They have a different meaning in the Self-Organizing Maps world. Neurons are grouped into two collections. The first collection represents input neurons and their number corresponds to the number of features in the dataset. The second collection represents output neurons, which are usually organized as one or two-dimensional arrays and are triggered only by certain input values. The location of each neuron is also important’ this is another thing that is different from the standard feed-forward artificial neural networks. Not only does each neuron have a location, but it is considered that neurons that lie close to each other have similar properties and actually represent a cluster. You can check out one of the previous articles in which this process is explained in great detail. While implementing Self-Organizing Maps with TensorFlow and Python was a lot of fun, I decided to do a similar thing with the C#. This way I am hoping to make these concepts more understandable to the .NET developers. Vector – Models all vectors in the system, like input neurons and weighted connections. Neuron – Models one neuron in the output matrix. SOMap – Models Self-Organizing Map itself. It is important to note that this solution covers only the creation of two-dimensional Self-Organizing maps that receives a one-dimensional array as an input. So, let’s take a look at the implementations of different classes. In order to cover everything defined in IList<double> interface, this class inherits List<double> class and implements IVector interface. The first thing that implementation of the EuclidianDistance function does is a check of the sizes of two vectors. Vectors must have the same size, which means that they have to be in the same dimension if we want to calculate the Euclidean distance for them. We cannot do this on one two-dimensional and one three-dimensional array, and that is why this check is performed. After that, this function does the calculation itself. Distance – Calculates the distance from that neuron to another neuron in the matrix. SetWeight – Sets a value to a weight defined by the index. GetWeight – Retrieves a value of a weight defined by the index. UpdateWeights – Updates weights of a neuron based on the input, learning rate and the distance decay. In the constructor of this class, weights of the connections are initialized to random values. 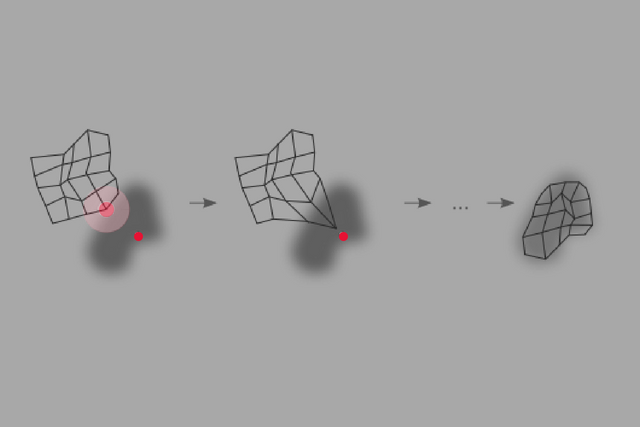 Distance method is implemented in a way that it returns the Euclidean distance between neurons in the matrix, based on the coordinates X and Y. The SetWeight and GetWeight check the index value within the range and after that, either set or retrieve the value of the weight. UpdateWeights method first checks if the input is in the proper dimension, and then it uses a formula defined in this article, to update weights on each connection of the neuron. The only publicly exposed members of this class are the constructors and the Train method. The constructor is used to receive dimensions and initialize the output matrix, as well as to handle some of the initial values for learning rate and a number of iterations. The Train method is one interesting method which implements the unsupervised learning process of Self-Organizing Maps. It is separated into several private methods that handle different aspects of this process. In essence, this method is one big loop that runs for a defined number of iterations. In each iteration, the first thing that is done is a calculation of neighborhood radius. This is done in CalculateNeighborhoodRadius method. This is driven by the number of iterations that had been run so far as well as the total number of iterations and dimensions of the output matrix. After this number is calculated, the BMU is determined for each input vector. For this purpose, CalculateBMU method is used. Afterward, the indexes of the neurons that are within radius are calculated. For each neuron within this radius, the distance from the BMU is calculated, which is used for calculating the new value for the distance decay. Finally, this value, along with the value of the learning rate is used to update the weights on each connection of the neuron. At the end of the Train method, the learning rate is updated after each iteration. First, the test input vector is created and a complete input dataset is created by repeating that value. These are just test values, used as an example. Then a 2×2 Self-Organizing Map is created using SOMap constructor. We also define that training will take 100 iterations and that the start learning rate should be 0.5. After that, the Train method is called with input we generated at the beginning. The goal of this article was to make the concepts of Self-Organizing Maps understandable to .NET developers. Apart from being a highly fun experience and experiment, I hope that some developers will benefit from the concepts explored here. We were able to see how to model and implement the main parts of the Self-Organizing Maps, such as neurons and vectors, and how to implement the unsupervised learning process. If you want to explore this field even further, now you can use a library that we developed here. In the next article, we will see discover how to solve a real-world problem using Self-Organizing Maps.